In 1893, Henri de Toulouse-Lautrec (1864-1901) was commissioned to illustrate five poems by Jean Goudezki (1866-1934, born Edward Goudez). The poetry was then set to music by Désiré Dihau (1835-1909), a classical bassoonist who was also Lautrec’s cousin. The first state of each lithograph was published without text by Edouard Kleinmann in an edition of 100. 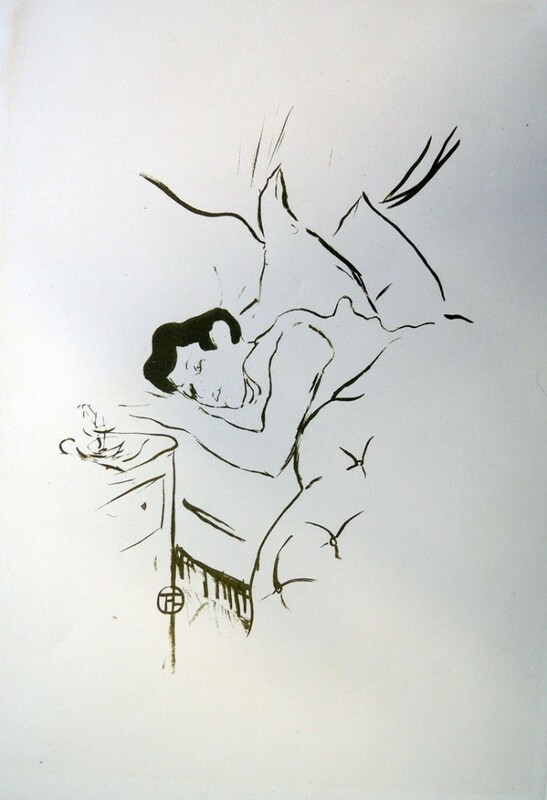 Goudezki called the series Les Vieilles Histoires (The Old Stories) and thanks to the Ruth Ivor Foundation, the Graphic Arts Collection recently acquired the first state of no. 5 in that series, Ta Bouche (Your Mouth). Each design was later transferred to a new stone and printed by Joly-Crevel Freres Successeurs together with text, so that it could be used as a decorative cover to printed sheet music. Additional color also added. The full portfolio included a cover by Lautrec and ten poems, five with illustrations. 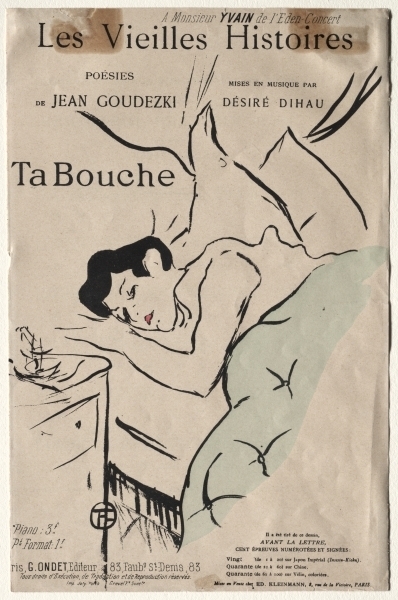 In the case of Ta bouche, the added text read: A Monsieur Yvain de l’Eden-Concert, Les Vieilles Histoires, Poésies de Jean Goudezki… Ta bouche…. The set is often listed as Collection Jean Goudezki, avec musique de Désiré Dihau. Les vieilles Histoires, 1893. Henri de Toulouse-Lautrec (French, 1864-1901), Ta bouche, from the series Les vieilles histoires. 1893. Lithograph. Edition of 100. Graphic Arts Collection GAX 2014- in process. Gift of the Ruth Ivor Foundation. This entry was posted in prints and drawings on February 17, 2014 by Julie Mellby.